We are going to continue our study and developing our synthesis opportunities with a further study of Palm Oil. We have already used Palm Oil as our focus for transboundary pollution as well as the environmental issues linked to a shift in food production systems. To wrap up this unit, we will complete the study with an example of how Civil Society (WWF, RSPO & Good Oil) aim to successfully raise awareness about, and find solutions for the environmental and social risks assoicated with Palm Oil production. International civil society organizations have the power to raise awareness about, and find solutions for, environmental and social risks associated with global interactions. Task 1 - Using the worksheet beneath and the information in the two videos above as well as the RSPO report, outline who the organisations are, how they have attempted to raise awareness, what solutions have they implemented and to what extent have they been successful. The ability to avoid the shock altogether. In January 2018, Apple announced plans to invest over $30 billion in capital expenditures in the U.S. over the next five years. 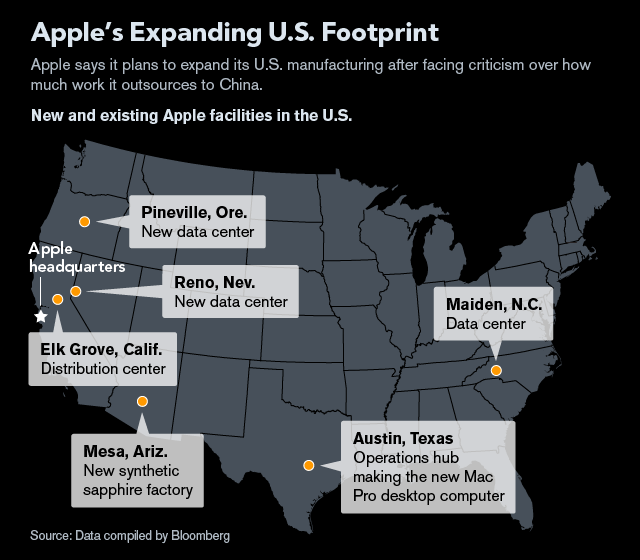 As part of the investment, Apple is increasing its commitment to its Advanced Manufacturing Fund -- used to invest in U.S. manufacturing companies and boost the domestic manufacturing sector -- from $1 billion to $5 billion. The move is projected to create over 20,000 new jobs at Apple's existing campuses and at a new office location which has yet to be announced. Apple's job creation announcement comes amid criticism aimed at the company for its outsourcing of manufacturing jobs to China, and accusations that it has dodged U.S. taxes by keeping some $250 billion overseas. A March 2017 press release from Apple claims the company supports some 4.8 million jobs in China, compared to 2.0 million in the U.S. Task 1 - Make a note of what economic resilience means. Task 2 - Define re-shoring and explain why there is a current trend of HIC governments to carry out the process. Task 4 - Use the two video above to explain why Apple are under pressure to re-shore their operations. To what extent does this aim to build economic resilience? In France, Parlement & Citoyens is an online platform that brings together representatives and citizens to discuss policy issues and collaboratively draft legislation. At the end of the process, a conclusory report explains if, when and how citizen input was incorporated into the resulting draft law.